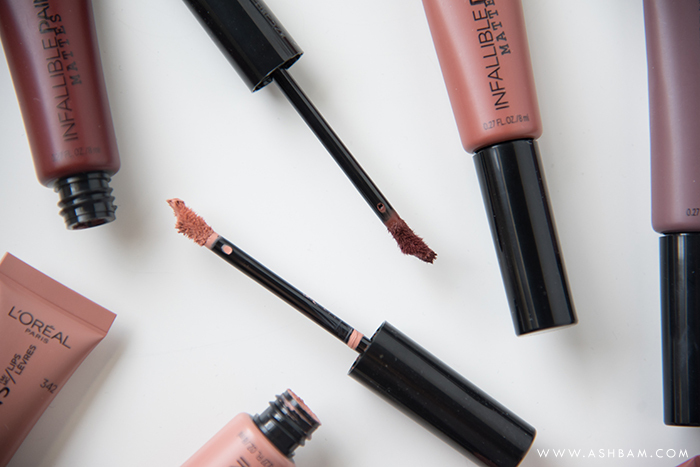 When I saw that L’Oreal were coming out with the Infallible Matte Lip Paints, a true matte line of their original lip paints, I couldn’t wait to get my hands on them! For months I had seen them all over my favorite UK blogger’s sites, but I had no idea if they would ever be released here. Finally a couple months ago they began popping up in various stories and then I spotted them on Ulta.com and couldn’t pass up trying the entire line. Brand claims: Lacquer up lips in high impact liquid matte lip color with L’Oreal’s Infallible Paints/Lips Matte. In one stroke, the designer applicator precisely diffuses vibrant full coverage matte color to lips for comfortable wear. There are 6 different shades and I’m not sure if they’ll be expanding the line at all, though I have a feeling that they might. It comes in a tube, but it still has a doefoot applicator. The applicator itself is very fuzzy and has quite an extreme dip in it that’s made to fit into the curve of the lips. Honestly it’s not my favorite applicator and the majority of the time I avoided using the curve. 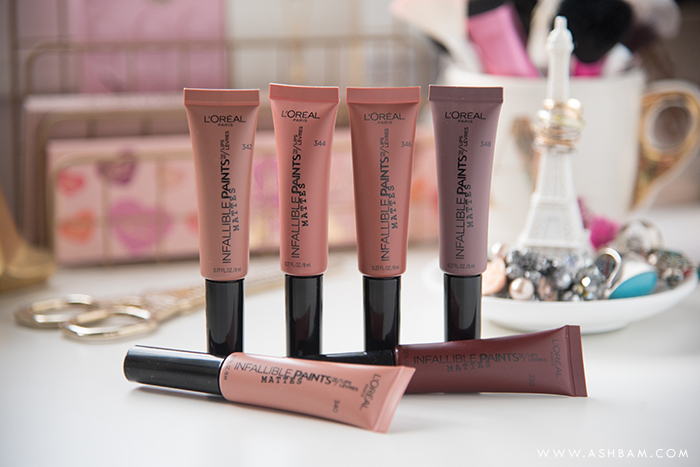 The formula is a thicker mousse and it spread really nicely onto the lips with great pigmentation. I didn’t notice a scent with any of the shades. They were transfer proof, which is definitely one of the biggest pluses to the line and they did feel comfortable, only starting to feel dry near the end of the day. Unfortunately things start to go down hill not too long after application. While the lighter shades start out gorgeous on the lips, they very quickly start to crack and separate. The darker shades did the same to some extent, but it wasn’t nearly as noticeable. I have done more in-depth reviews of each shade over on my Instagram, so check the links below to read more! 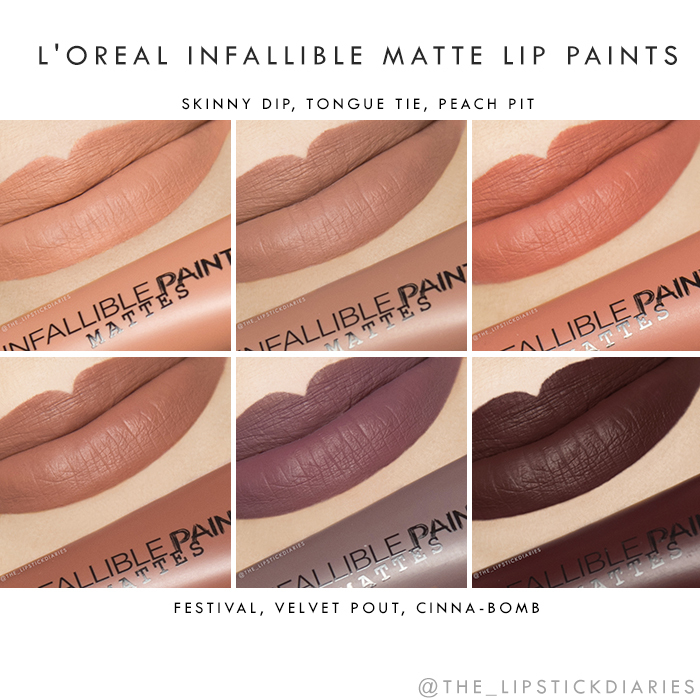 So overall I’m not a huge fan of the L’Oreal Infallible Matte Lip Paints and really wished the nudes, which were gorgeous shades, performed better. If you’ve tried these let me know in the comments! Did you have a similar experience or did you love them? If you have any tips to help the wear time that would be very appreciated as well!